This is the best Batting Tee made. You get what you pay for. The Pro X Tee is a single tee and is built to last and built to be portable. There is no better tee on the market. 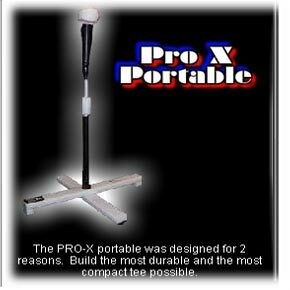 The Pro X Tee is a great batting Tee. It is the most portable and durable hitting Tee made. The ball comes off clean and the tee top does not impede the bat path. From Tee Ball to Pro Ball nothing outlasts or outperforms the Pro X Tee Single. With the folding X base the Pro-X Tee fits into any bat bag to insure you will always have a tee with you. The PerFlex Tee top outperforms all rubber tee tops for durability while providing minimal interference with the swing. Constructed of steel and high density polyethlene the Pro X Tee will stand to the rigors of all levels of play. Easily adjustable from 24" to 40" to fit any training situation or player height. Hello. [url=https://goo.gl/q3SKPj]Your post[/url] has interested me, we can continue discussion? Thanks.